This morning we started our search for whales on the northwest corner of Stellwagen Bank. There wasn’t much to be seen in this area so we headed down the bank near the eastern edge and ended up finding a humpback whale. 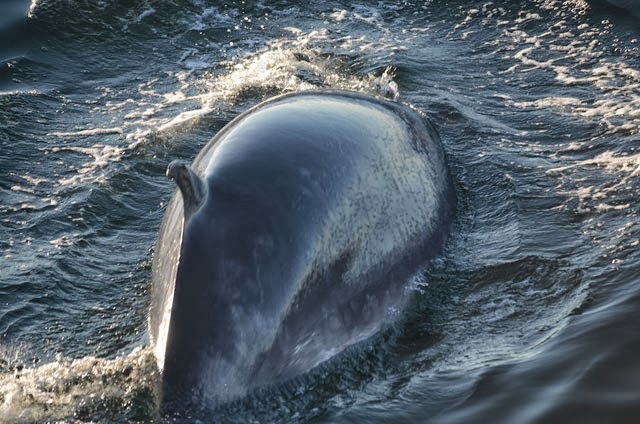 But first we noticed several minke whales in the area. There were at least three deep feeding and popping up consistently near the boat. They were close enough to see the ‘minke mittens’, or bright white bands on their tiny flippers, glowing green under water. 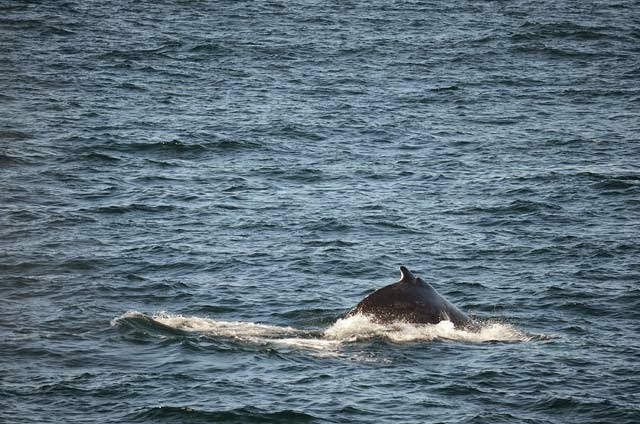 We also got very nice looks at the humpback in the area, a male named Peninsula, born in 1985 to humpback Silver. Peninsula was diving for approximately 6 to 7 minutes and gave us a couple great looks at the underside of his fluke. Despite a bit of seas, it was a great trip! In the afternoon, the Aurora headed we headed south to catch up with Peninsula deep feeding and traveling through the area, taking moderate dives. 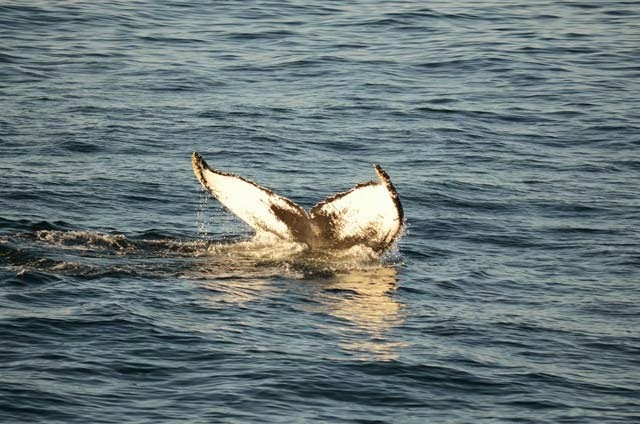 He showed us his fluke quite a few times, and it was great to see a humpback out on Stellwagen! We wrapped up the trip on a scattered group of five minkes, which we observed taking many tight-turns in a similar area, most likely all feeding on the same patch of bait. These minkes weren't shy of the boat — we were treated to a few great close to boat looks before we headed back home to Boston. On the Asteria we headed out to the southwest corner of Stellwagen Bank. It was a beautiful day out on the water. Down at the corner we found a single humpback whale and a number of minke whales. 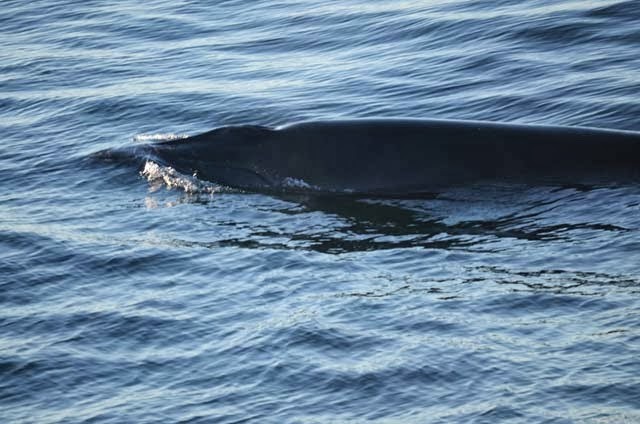 We spotted the minke whales every so often but our main focus was the big humpback. This whale spent a lot of time down on dives and would only come up for a few breathes. It didn’t show its tail very often so unfortunately we weren’t able to get an ID; it does have a big scar on its dorsal fin which could help to identify which individual it was. It did bring its tail out of the water once, but I wasn’t quick enough to snap a photo. Even though we haven't been able to identify this whale yet, we got some great looks and enjoyed a nice day out on the water.